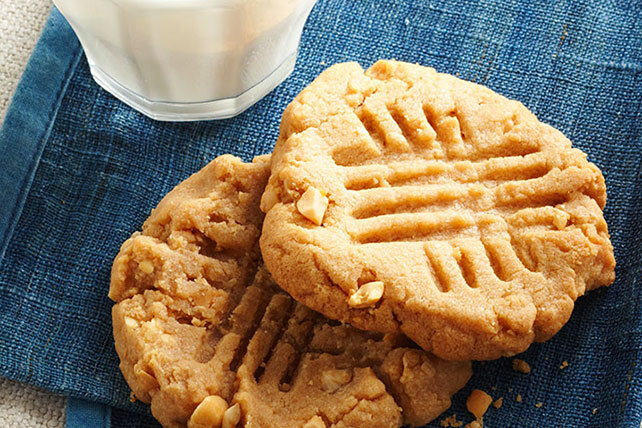 Easy Peanut Butter Cookies? We'll say! Five ingredients. 25 minutes. No flour to measure. The result: Deeply, intensely peanut-buttery cookies. Shape into 1-inch balls. Place, 2 inches apart, on baking sheets. Flatten, in crisscross pattern, with tines of fork. Bake 10 min. or until lightly browned. Cool on baking sheets 1 min. Remove to wire racks; cool completely. These easy-to-make cookies don't need any flour. Plastic storage containers and resealable plastic bags keep cookies fresh. Old-fashioned cookie tins do the job well, if they have a tight seal. Never store cookies in any kind of container until they have cooled completely.